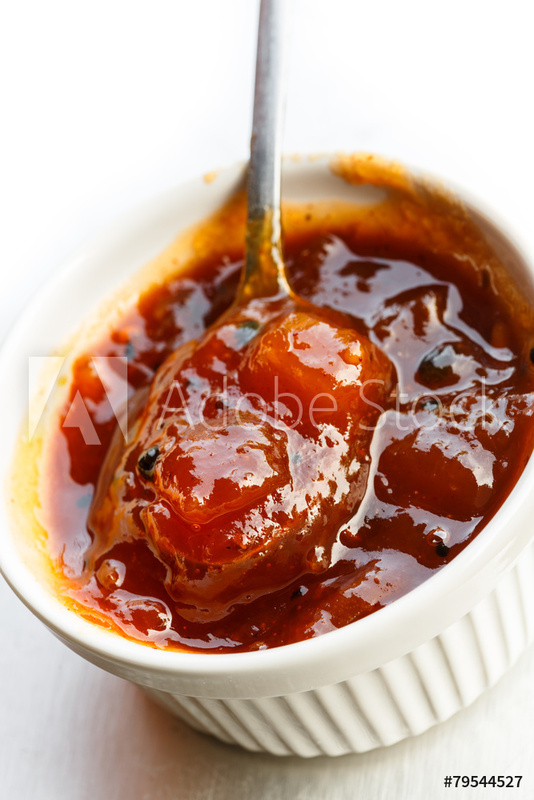 At Buckhorn we sometimes offer a chutney as an accompaniment to meat dishes. To those unfamiliar with chutney, it is a lovely taste treat. Chutney originated in India as long ago as 500 BC and usually refers to a relish made from fresh fruits and spices. It comes from the Indian word “chatni” which means “crushed”. British colonials took chutney home with them and made it their own. They also brought the condiment to outposts in South Africa and the Caribbean where chutneys were made from local fruits. In England commercially-made cooked chutneys are readily available these days. They are typically made of fruit, often apples or pears, onions and raisins. These ingredients are simmered with vinegar, brown sugar and spices for several hours. The most famous commercial chutney in England is Major Grey’s Chutney. The name is based on a mythical colonial British officer who made his own chutney to accompany curry. Chutneys can be sweet or sour, spicy or mild, thin or chunky and can include such seasonings as garlic, ginger, mint, turmeric, cinnamon, cilantro or hot chilies. In a large saucepan combine the vinegar, honey, brown sugar, coriander, cinnamon stick, cloves and bay leaf and bring to a simmer. Add the pineapple, mango, papaya, garlic, ginger and pepper and season lightly with salt and white pepper. Simmer over low heat for 30 minutes. Let cool. Discard the cinnamon and bay leaf. Serve at room temperature or chilled. The chutney can be refrigerated for up to 2 weeks. This recipe yields about 3 cups.